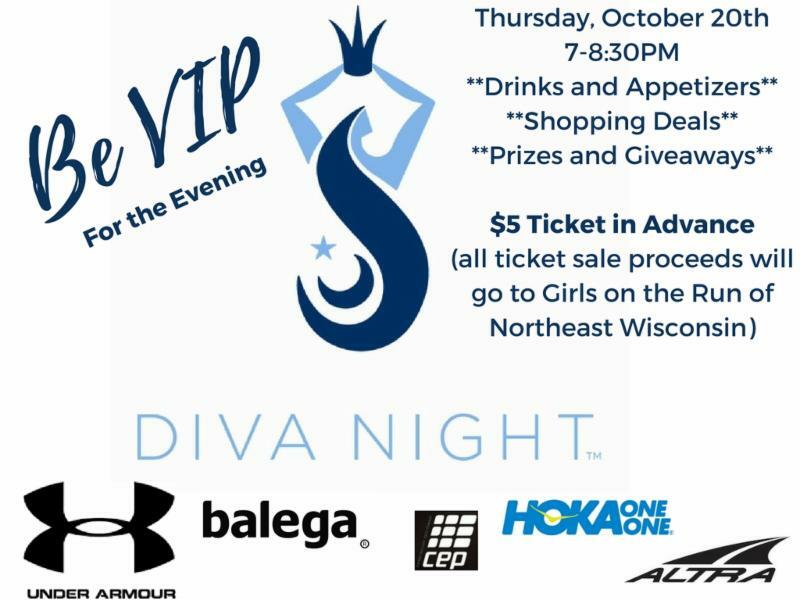 Diva Night 2016 is Oct. 20! Home › Latest News › Diva Night 2016 is Oct. 20! Join us Thursday, Oct. 20th, 7:00 - 8:30 PM. Register in advance to reserve your spot. Join us at our annual event for music, food, bra fits, drinks, fall fashion, and raffles! Under Armour, Balega, CEP, Hoka and Altra will be joining us for the fun! Your $5 registration gets you IN to the event and 100% of registration profits will be donated to Girls on the Run of Northeast Wisconsin (http://girlsontherunnew.org/), a nonprofit organization positively impacting 3rd - 8th grade girls in our community. Bring a friend! Follow us on Facebook, Twitter and Instagram to keep up with the details as the event unfolds!